On December 15, Beijing staged a grand opening ceremony for the 4th China Summit on Green Development and Ecological Conservation and the Launch Ceremony for the Casebook on Green Development in China (2017), sponsored by Xinhuanet and co-organized by Chinese Society for Environmental Sciences. 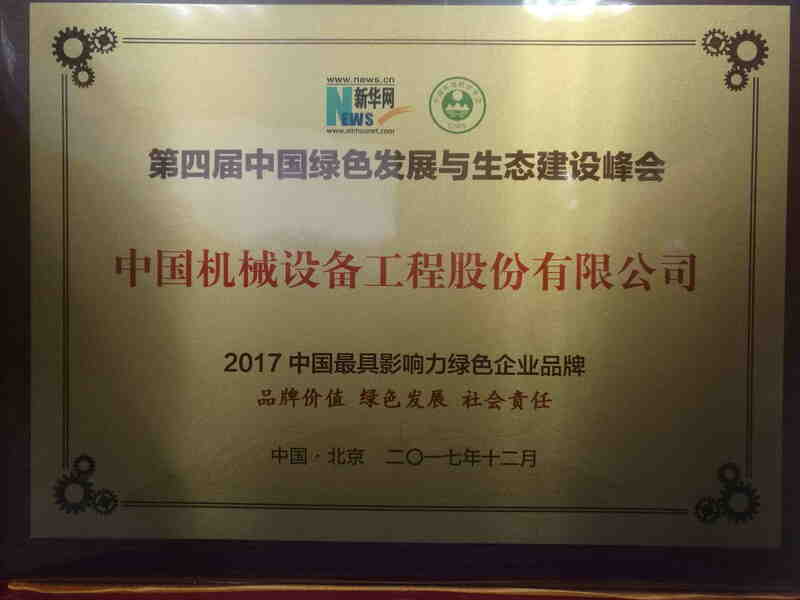 CMEC was recognized as the “Most Influential Green Corporate Brand in China in 2017” thanks to its tremendous brand influence and outstanding market performance at home and abroad over the years, in particular its practice of green development in the Tenaga 49.5MW wind power project in Pakistan. The event, themed on “Green China, Green Future”, consisted of four parts: the forum on green development in China, the release of the casebook, the discussion over core assets of corporate brands, and the announcement of Model Cities in Green Development and the Most Influential Green Corporate Brands in China in 2017. Mr. Shen Jiangying, Vice President, Board Director and member of the Standing Committee of the Party Committee of Xinhuanet, delivered the welcome speech. He was followed by keynote speakers such as Jiang Zehui, Deputy Head of CPPCC Commission for Population, Resources and Environment, and He Keng, deputy-director member of the Commission for Fiscal and Economic Affairs of the 11th NPC Standing Committee and famous economist. The event gathered an audience of nearly 230, including experts, scholars in related fields, local government officials, representatives of prestigious Chinese companies and journalists. The brand rating campaign highlighted green practices and the fulfillment of corporate social responsibilities, was authoritative, covered a lot of corporate brands, communicated to a large audience, and was of great reference and exemplary value. The honor has boosted the brand status and influence of CMEC, creating a favorable atmosphere for CMEC’s green development and future fulfillment of corporate social responsibilities.